Doctor of emergency medicine and California State University, Northridge alumna Celina Barba-Simic has made a gift to the CSUN College of Science and Mathematics to create the Dr. Celina Barba-Simic Biology Scholarship in Honor of Dr. Steven Oppenheimer. Barba-Simic said she decided to make the gift after realizing that Oppenheimer "changed the trajectory of [her] life." Photo courtesy of Celina Barba-Simic. It’s a rare time for an emergency room when the phones aren’t ringing and patients aren’t arriving, but that can all change in minutes, according to an ER superstition. As soon as someone remarks, “It’s going to be a quiet night, isn’t it?,” everything changes: Ambulances flood the ER with patients until it’s bursting. As a doctor of emergency medicine and Co-Medical Director of Burbank Emergency Medical Group at Providence Saint Joseph Medical Center in Burbank, it’s a situation that Celina Barba-Simic ’92 (Cell and Molecular Biology) knows all too well. Barba-Simic’s only access to medical care as a child was the busy county emergency department, which “normalized” long waits, chaos and language barriers for the alumna. When she decided to pursue a career in medicine, emergency medicine was the only specialty she considered. Barba-Simic always knew she wanted to work in medicine, but she never imagined that learning not to say the “Q” word would be such a valuable lesson — nor did she know that she would be drawn to the fast-paced world of emergency medicine. Her path became clearer when she took a human embryology course with — and later joined the Center for Cancer and Developmental Biology of — esteemed biology professor Steven Oppenheimer at California State University, Northridge. His influence on her was so profound that Barba-Simic recently made a gift to the CSUN College of Science and Mathematics to create the Dr. Celina Barba-Simic Biology Scholarship in Honor of Dr. Steven Oppenheimer. The annual scholarship will provide one award for an undergraduate student with demonstrated financial need who is also conducting laboratory research in the College of Science and Mathematics’ Department of Biology. In unraveling 20 years’ worth of layers, Barba-Simic remembered her inspiring professor of human embryology. Oppenheimer, who has mentored thousands of students during his 40-year tenure as a CSUN professor, said that Barba-Simic stood out when she was an undergraduate. In the lab, Barba-Simic helped research cell surface carbohydrates in adhesion and migration, to explore how cells’ surface sugar-containing receptor sites change during development. The study aimed to determine the function of those carbohydrates in order to find causes of cancer-cell spread. Barba-Simic said the professor’s encouragement made a profound impact on her life. Although she learned many things from him, the most important idea the professor instilled in Barba-Simic was this: You can be a doctor if you want to be. A first-generation college student born in Mexico and raised in Pacoima, Barba-Simic and her parents came to the U.S. when she was three months old. She started working at the age of 15 and had two jobs by the time she was 16. She used her wages to pay for essentials. Financial and cultural constraints led Barba-Simic to CSUN, where she initially enrolled as a physical therapy major. Once at CSUN, she encountered cultural barriers to her education from well-meaning family and friends. “I knew I wanted to be a physician, but everybody told me, ‘Oh, don’t be a doctor. It takes too long and you’re going to get married anyway,’” Barba-Simic said. 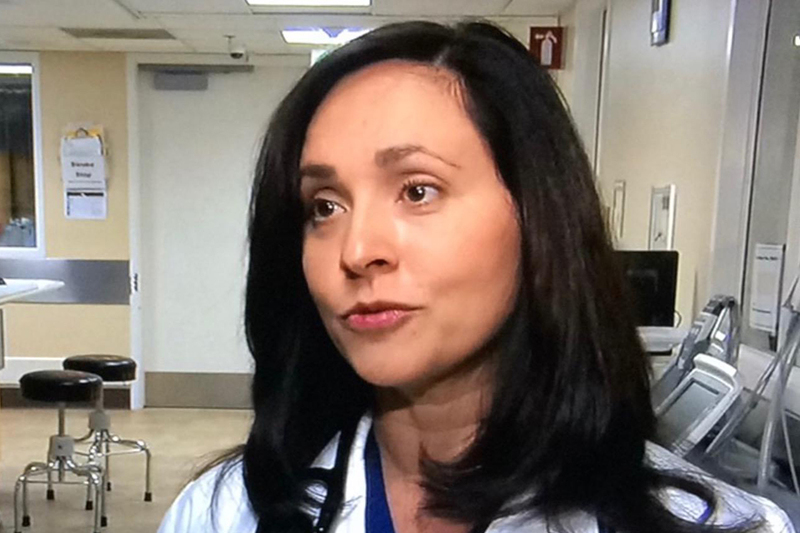 Despite the financial and cultural barriers, Barba-Simic paved her way to medical school by volunteering at the Veterans Affairs Sepulveda Ambulatory Care Center, just a few miles east of campus, doing research and participating in on-campus organizations such as Chicanos for Community Medicine. At the end of her undergraduate time at CSUN, Barba-Simic received multiple awards including Graduating Student of the Year Award from the Department of Biology and the Minority Achievers in Science Student of the Year Award. She also received multiple scholarships, fostering her appreciation of the financial needs of low-income students and later inspiring her to make a gift to aid those in need. As an involved undergraduate, Barba-Simic applied for — and later received — the National Institutes of Health Minorities Access to Energy Related Careers grant, with Oppenheimer’s encouragement, she said. “The grant paid for two years [of undergrad], so I was able to stop working,” she said. “In the summer, the grant allowed me to conduct research in a Department of Energy lab and use the skills that Dr. O taught me. “I was lucky to be at Lawrence-Berkeley National Laboratory working under Dr. Levy … where my job was to irradiate mice brain cell cultures, subjecting them to different levels of radiation and testing Bragg peaks using the linear accelerator. This was but a small part of the research that Dr. Levy used to perfect proton therapy for high-precision treatment of brain tumors and vascular malformations,” she added. After graduating from Stanford Medical School, Barba-Simic completed a three-year emergency medicine residency at Harbor-UCLA Medical Center, where she started work as early as 4 a.m. and ended as late as 7 p.m. — the following day. This meant Barba-Simic often worked 38-hour shifts and 120-hour weeks. On top of extremely long hours, in the first three months of her residency, Barba-Simic became pregnant with her first child. She went to her fellow residents and asked to switch schedules around so that her vacation was at the end of her first year. At the start of her residency, she was one of two women in a class of 12, but she didn’t let that disparity discourage her from accomplishing her goals and realizing her full potential. The influence that Oppenheimer had on her was invaluable, as was the education and training he provided. “Dr. Oppenheimer changed my life by believing in me and providing the opportunity,” she said.